In the VVT (Variable Valve Timing) system, the appropriate intake and exhaust valve open and close timing is controlled by the ECM. The ECM performs intake and exhaust valve control by performing the following: 1) controlling the camshaft and camshaft timing oil control valve assembly, and operating the camshaft timing gear; and 2) changing the relative positions of the camshaft and crankshaft. To monitor the correlation of the intake camshaft position and crankshaft position, the ECM checks the VVT learned value while the engine is idling. The VVT learned value is calibrated based on the camshaft position and crankshaft position. The intake valve timing is set to the most retarded angle while the engine is idling. If the VVT learned value is out of the specified range in consecutive driving cycles, the ECM illuminates the MIL and stores DTC P0016. To monitor the correlation of the exhaust camshaft position and crankshaft position, the ECM checks the VVT learned value while the engine is idling. The VVT learned value is calibrated based on the camshaft position and crankshaft position. The exhaust valve timing is set to the most advanced angle while the engine is idling. If the VVT learned value is out of the specified range in consecutive driving cycles, the ECM illuminates the MIL and stores DTC P0017. Read the Pending DTCs [G]. Input the DTC: P0016 or P0017. Check the DTC judgment result [D]. If the judgment result shows INCOMPLETE or N/A, perform steps [E] through [G]. Drive the vehicle for 2 to 3 minutes [E]. Idle the engine for 5 minutes or more [F]. Check the DTC judgment result [G]. 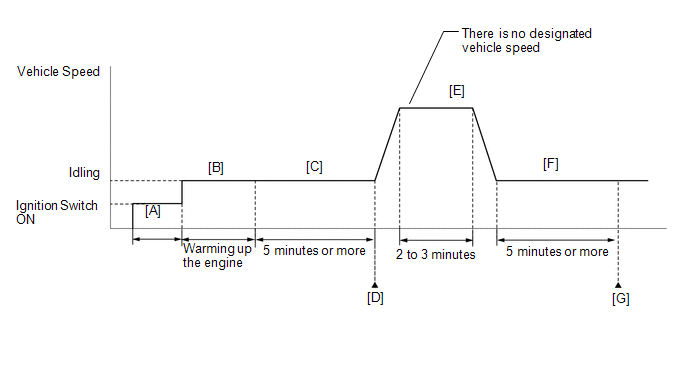 The monitor for this DTC detects when the timing chain is shifted by one tooth or more. If any DTCs other than P0016 or P0017 are output, troubleshoot those DTCs first. (d) Check the camshaft timing oil control valve assembly for intake camshaft. (1) Enter the following menus: Powertrain / Engine / Active Test / Control the VVT Linear (Bank 1). (2) Check the engine speed while operating the camshaft timing oil control valve assembly (for intake camshaft) using the Techstream. (e) Check the camshaft timing oil control valve assembly for exhaust camshaft. (2) Check the engine speed while operating the camshaft timing oil control valve assembly (for exhaust camshaft) using the Techstream. (a) Connect the Techstream to the DLC 3. DTC P0016 or P0017 may be stored when foreign objects in the engine oil are caught in some parts of the system. The DTC will remain stored even if the system returns to normal after a short time. These foreign objects may then be captured by the oil filter. Inspect the specified camshaft timing oil control valve assembly (for intake or exhaust camshaft) in accordance with the inspection result of step 2. (a) Inspect the camshaft timing oil control valve assembly (for intake or exhaust camshaft) (See page ). (a) Replace the camshaft timing gear assembly or camshaft timing exhaust gear assembly (See page ). Perform "Inspection After Repair" after replacing the camshaft timing gear assembly or camshaft timing exhaust gear assembly (See page ).